The sheriff said he's never seen this level of destruction. 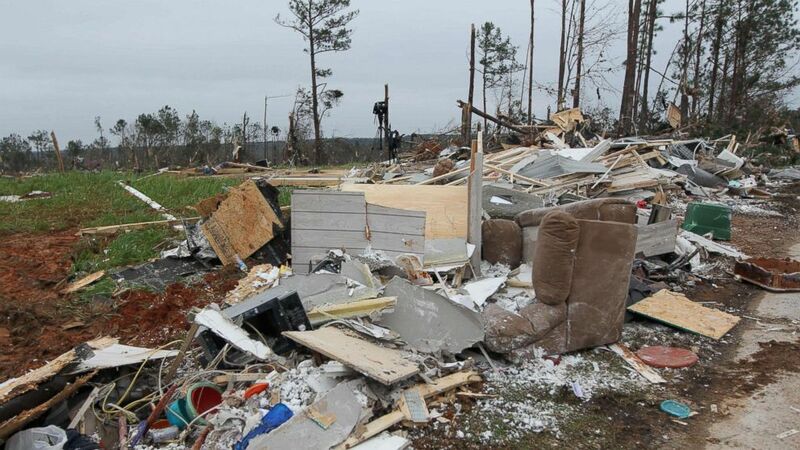 At least 23 people were killed in an Alabama town when a slew of tornadoes ripped through Sunday, leaving behind "catastrophic" damage, said Lee County Sheriff Jay Jones. This storm brought the highest tornado death toll in the United States since 2013, according to the National Weather Service. At least three children -- age 6, 9 and 10 -- were among the victims, according to the local coroner. 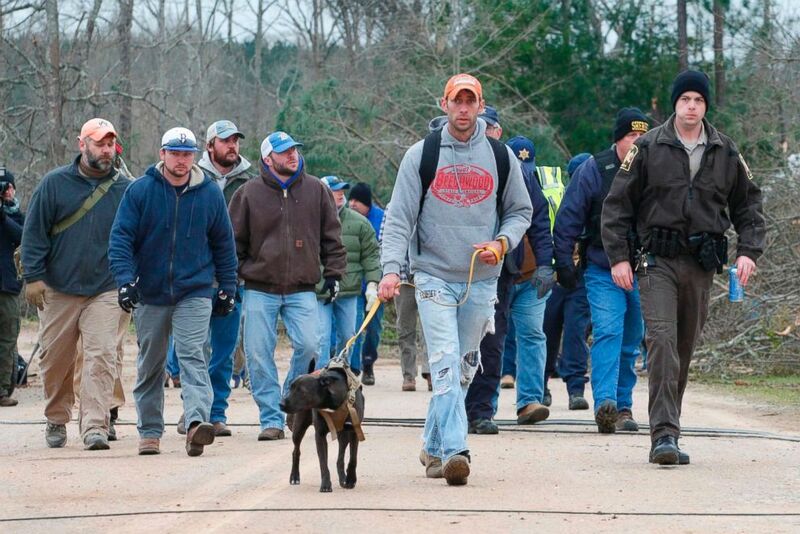 Those killed lived in roughly a one-square-mile area of the town of Beauregard, a resilient, community-oriented town of roughly 9,000, Jones said, and many miraculously escaped with their lives. In this area, which has many mobile homes, houses were "completely destroyed, nothing left but the slabs -- concrete slabs that they existed on," Jones told "Good Morning America" Monday. Storm surveys were ongoing, but preliminary reports indicate the deadly twister reached an EF-4 category with winds estimated at 170 mph. Jones said he has never seen this level of destruction. 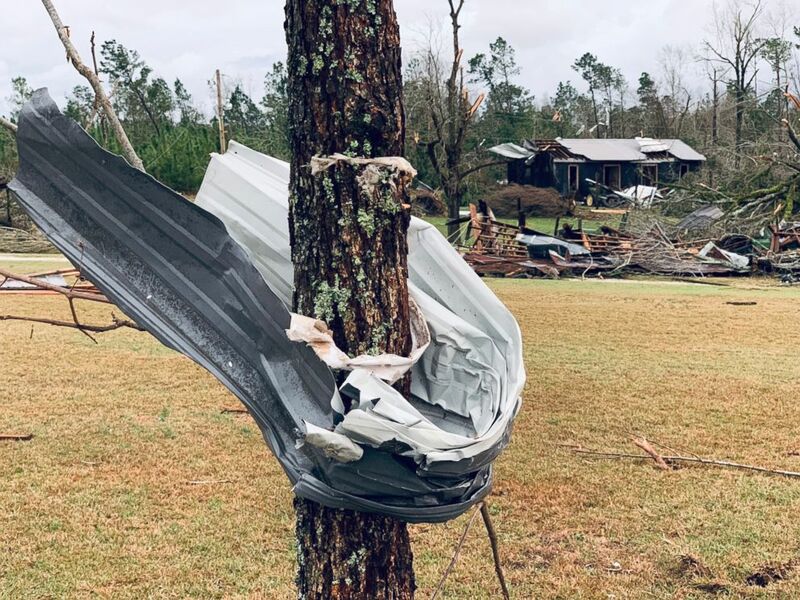 (Tami Chappell /AFP/Getty Images) Damage is seen from a tornado in Beauregard, Ala., March 4, 2019. 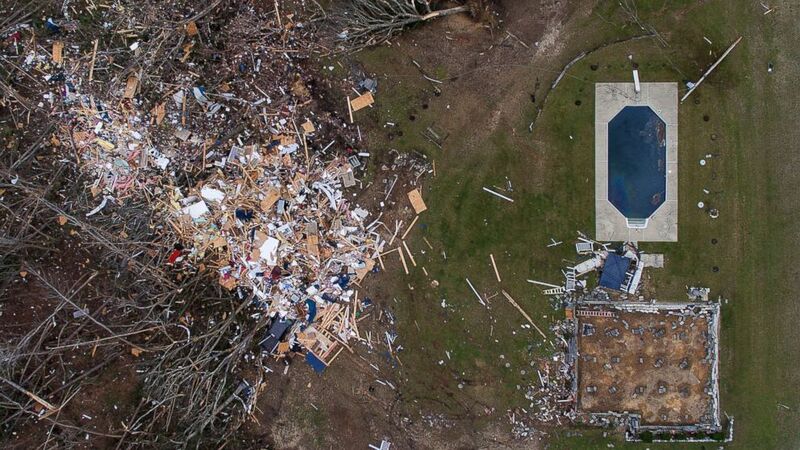 (David Goldman/AP) Debris from a home litters a yard the day after a tornado blew the building off its foundation, lower right, in Beauregard, Ala., March 4, 2019. 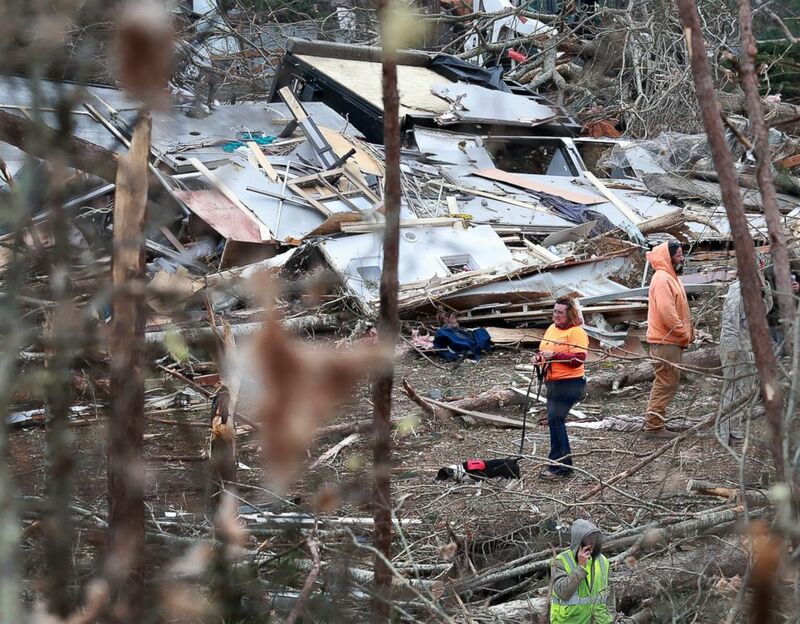 (Curtis Compton/Atlanta Journal-Constitution via AP) A woman and her dog make their way through the wreckage of shattered homes, March 4, 2019, as rescue workers, residents and volunteers sift through the debris following a tornado, in Beauregard, Ala.
"This is a disaster," Beauregard resident Douglas Griffin, whose home was destroyed, told ABC News. He said it's "like a bomb went off." Griffin was on his way to the store when a tornado struck. He said he thinks he would've been killed if he was home at the time. "I'm blessed to be alive," Griffin said. 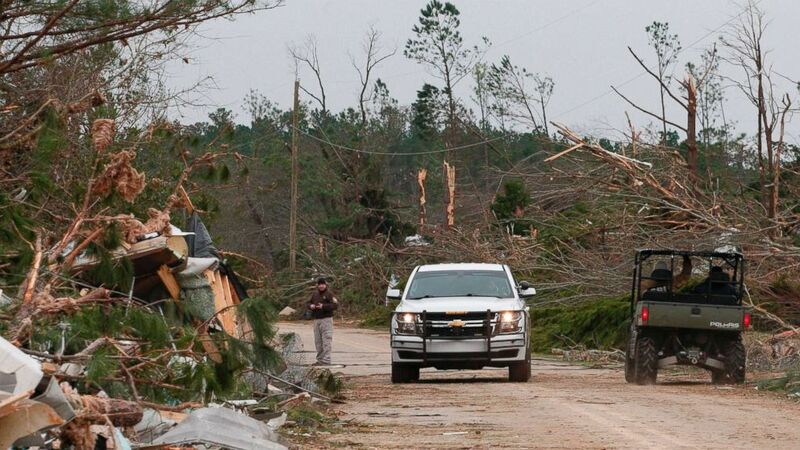 (Tami ChappellAFP/Getty Images) Damage from a tornado is seen as Lee county deputies secure the scene in Beauregard, Ala., March 4, 2019. (Scott Fillmer) Tornadoes have struck parts of Alabama, near the Georgia state line, to Macon, Georgia, about 100 miles to the east. March 3, 2019. At least 12 reported tornadoes were reported in Alabama while Georgia saw 16, according to data from the National Weather Service. Residents in the Beauregard storm's path shared harrowing video on social media Sunday as winds ripped apart entire neighborhoods. One person posted footage of what appeared to be an uprooted metal guardrail wrapped around a tree, while others shared videos of large poles and street lights twisting in the wind. "Debris is just everywhere," one Twitter user wrote. "Parts to people's houses, random mattress in our driveway, trees down everywhere I can look, power lines down everywhere." Residents Kevin and Becky Boyd they were in their trailer when the tornado hit, rolling the trailer over. Becky Boyd described it as "terrifying" and the "worst thing you could ever think of happening to you." They feel lucky to have escaped alive, but Kevin Boyd told ABC News, "We lost everything. One day you got everything, next day you ain't got nothing." 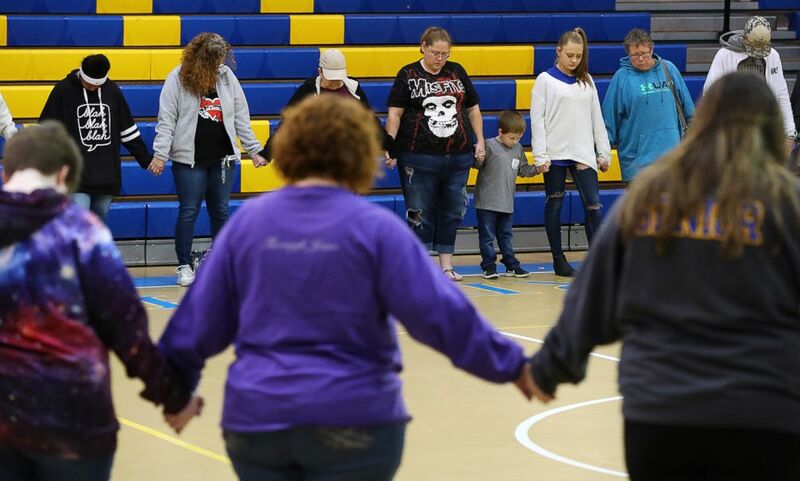 (Curtis Compton/Atlanta Journal-Constitution via AP) Students, teachers and residents hold a prayer circle in the gymnasium of Beauregard High School for those in their community that lost their lives in a Sunday night tornado on Monday, March 4, 2019, in Beauregard, Ala.
President Donald Trump said Monday, "Our whole nation mourns for the more than 20 lives lost and for the heartbroken families they leave behind." "You look at the areas affected and probably nobody made it out of that path. That path was brutal," Trump said. "To the community of Lee County we grieve by your side and we pledge our unwavering support to help you rebuild from the very depths of this horrible tragedy." (Tami Chappell/AFP/Getty Images) A search and rescue team walk past damage from a tornado in Beauregard, Ala., March 4, 2019. "I've directed FEMA [the Federal Emergency Management Agency] to provide immediate assistance to the great state of Alabama," he said. An average of 80 people die annually from tornadoes in the U.S., although just 10 died in 2018, according to data from the National Weather Service. ABC News' Steve Osunsami, Rachel Katz, Melissa Griffin, Max Golembo, Alex Mallin, Joshua Hoyos and Darren Reynolds contributed to this report.